Hi everyone and welcome to the latest installment of My Week Unwrapped, where I go over the games I’ve been playing these last seven days. The earlier part of the week was a bit slow, so I caught up on some games I’d been meaning to start or finish. But today we had some exciting releases that are worth checking out. I have some full write-ups for them, so I won’t say too much here, but you should read what I’ve had to say about them so far. Anyway, let’s get this show on the road! I was really enjoying Marker’s Samsara back when it released a few weeks ago. I liked it enough to pay $4.99 to unlock the rest of the game. And then I got stuck on the seventh level of Chapter 3! I kept coming back to it and still couldn’t figure it out, so I took a bit of a break from the game. Since the earlier part of this Week was pretty quiet, I decided to give it another try. It turns out, I missed a very important detail about one of the mechanics and that was the first time it was used. Once I solved that level, I just kept going, occasionally getting stumped for a bit, but eventually completing the game without any help. I really enjoyed this one, as it’s a relaxed puzzler with some innovative mechanics that evolve as you progress. The artwork and soundtrack are just icing on the cake. I’m not sure if I’ll have time to write a full review for the game, but this is one I’d highly recommend. You should at least download the game and play through the first two chapters, since they’re free. If you like them, it’s a pretty good bet you’ll enjoy the rest of the game as well. And if you get stuck, I completed my walkthrough guide. I just need to finish making videos for the rest of the chapters. I’ve played several Syntaxity games in the past, such as Blackthorn Castle, but it had been a while since I’ve played any new ones. They recently released Bigfoot Quest and sent me a copy, so I started playing and working on a walkthrough. I’m still making my way through the game, as some clues can be a bit obtuse. But overall, I’m enjoying it. It is a bit of a turnoff that fast travel costs extra money, especially since the game keeps reminding me that it’s there. But if you can ignore that and don’t mind that hints cost extra as well, it seems to be a pretty solid adventure game with some interesting puzzles. Hopefully I’ll make more progress soon and finish the game. Until then, you can follow along with my walkthrough guide. Spotlightor’s Candleman was by far the game I was looking forward to the most this week, but I also had concerns because of the App Store’s shoddy English. I’m glad to say, though, that there’s no reason to worry. The game plays great, has touch controls instead of on-screen buttons, and is just a joy to look at. But rather than repeat myself, I’ll just let you read my impressions here. Nord Unit’s Hyperforma is the other game I was looking forward to this week, primarily because of its artwork and soundtrack. Unfortunately, I’m having a tough time getting used to the controls, as there’s a lot going on at once. You can read more about it here and watch my gameplay video to see what it’s like. I played a bit of the original Kleptocats back when it released, since I’m a big fan of Hyperbeard’s match-three game, Muertitos. I liked the idea of Kleptocats, especially since there seemed to be a weird story and secrets to uncover, but I just didn’t have the patience to wait around for my cats to bring me stuff and I lost interest quickly. But I figured I’d give the sequel a chance anyway. As I suspected, there are timers that keep growing and growing, but you can pay real cash to reduce them. I refuse to buy consumables in any game, so it got old for me really quick. I thought maybe the mini games could keep me occupied while waiting for those timers to run down, but they’re also boring. Bottom line is, if you don’t mind checking your phone every once in a while to collect things from a F2P game, you might enjoy it. But if you get annoyed with stuff like that, as I do, you should probably steer clear. And last, I’ve been playing a lot of Aaron Steed’s Six Match, as I’m determined to beat my current high score. I’ve maybe gotten a little too obsessed, as I’ve been starting over every time I end up in a jam and have to use a life. I’m currently working out the scenario below and have been stuck on it all day! My videos of the game are pretty old, but I’ll try to make a new one sometimes soon that will show off the later part of the game. 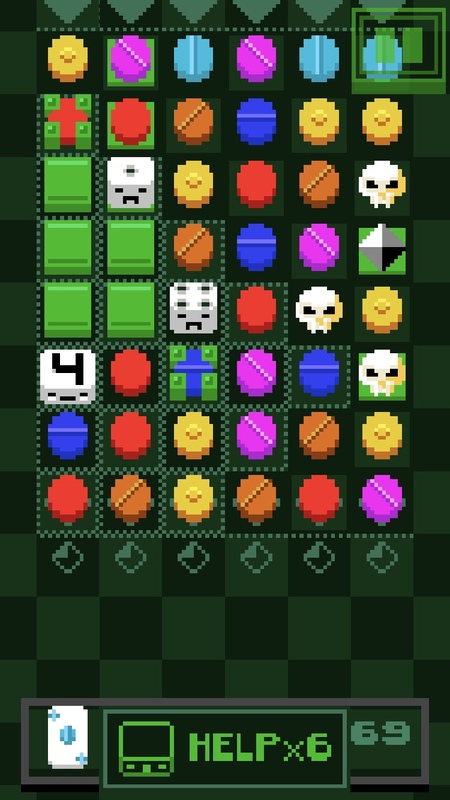 Anyway, it’s a really solid match-three that’s free with ads and a very reasonable IAP to remove ads if you like the game enough to keep playing. Don’t miss out on this one! And that’s everything I’ve been playing this past week, along with some pre-release games I’ll be able to talk about soon. Let me know in the comments section what games you’re enjoying and I’ll see you back here next time with more of My Week Unwrapped!